Asheville, NC – A new research paper, “Siting of Wood Pellet Production Facilities in Environmental Justice Communities in the Southeastern United States” has been published this month in Environmental Justice, a peer reviewed scientific journal, by Sam Davis, research manager at Dogwood Alliance and Stefan Koester, of Tufts University. The paper examines the burgeoning wood pellet production industry in the Southern United States, where the facilities are increasingly marred by controversy around self-proclaimed statements of being “clean” and “green” energy. Wood pellet production facilities release fine particulates, nitrogen oxides, carbon monoxide, and volatile organic compounds in the air while operating, which can place a substantial burden on nearby communities already struggling with other polluting industries in the area. Davis and Koester examined the relationship between locations of wood pellet production facilities and the economic and racial diversity of areas where they are located. The authors found that wood pellet production facilities in the southeastern United States are 50% more likely to be located in “Environmental Justice” (EJ) communities — counties where the poverty level is above the state medium, and at least 25% of the population is nonwhite. 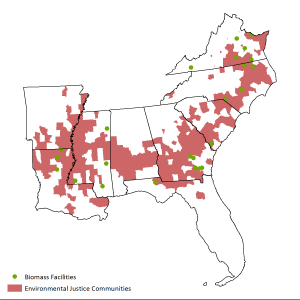 This finding identifies a worrying trend in wood pellet production facilities (also known as “biomass” facilities) in the South — that they are being placed in low-income communities of color where often other polluting industries exist. 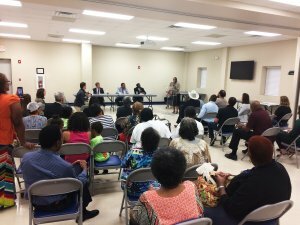 This pattern was especially egregious in both North Carolina and South Carolina, where every large wood pellet production facility analyzed was located in an existing Environmental Justice community.